The kneeling arm and leg extension is one of the best Pilates balance exercises because it incorporates both strength and stability of the core right into the exercise. This Pilates exercise does much for the whole body; It helps you learn to stabilize your center while moving your limbs, while improving your pelvic stability and strengthening your gluteal muscles. Check out the 3 progressions of this great Pilates balance and back extension exercise listed below. Learn all of them in this order to make it more effective. Position: Get on your hands and knees with your hands directly under your shoulders and knees under hips. Elbows should not be locked. Keeping your spine long and still, imagine squeezing or vacuuming a marble up into your belly button as you exhale. Next inhale, and drop the marble to the floor again without moving your spine. Feel your deep transverse abdominal muscles working deeply on a line between your hipbones. See more Pilates Balance exercises here! As you inhale, start extending one leg behind you and then raise it until it is just parallel with the floor. Keep your hips level and square with the floor. Exhale and return to start. Repeat 4-6 times per side, alternating legs. 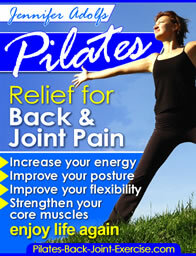 This is where you will really feel the Pilates Balance working. Keeping your spine and waist long, extend one leg back and up, as you simultaneously extend the opposite arm just parallel to the floor. Alternate 4-6 repetitions on each side. Notes: Keep your trunk as still and unmoving as you can. Lengthen out from your tailbone to the crown of your head. Draw your belly button in like the Tummy Vacuum, but do not round your spine. Keep your chest open and neck long. Remember, there is no tension in your upper body. To further challenge your balance, try this exercise on the unstable surface of an exercise ball. Using a Ball is a great way to further your Pilates practice and improve more upon your balance. Check out my new Core Ball DVD Here. Check out all of the Pilates Exercise of the Month Moves! Pilates Side Kicks to strength the Hips and Legs.